Indian Hot Springs , a water hole south of Sierra Blanca, Hudspeth County, Texas. Indian Springs is approximately 11 miles south of present day Interstate 10, and is commemorated by a Texas County Historical Marker. The best route to visit the memorial gravesite at Indian Hot Springs is to proceed east of El Paso on I-10 to Exit 87, and then proceed southeast FM 34 which becomes FM 192 which becomes RR 192 (Indian Hot Springs Road)for approximately 35 miles. Recent photos of the Indian Hot Springs Memorial. The facility in the background of Photos 6, 7 and 8 are of Indian Hot Springs, a naturally occuring hot mineral waters spring well, located directly across from the memorial gravesite on Indian Hot Springs Road. The Rio Grande River and Mexico are just behind the Indian Hot Springs property. Although official and contemporary accounts of the battle vary, at least five buffalo soldiers were reported slain in the attack and were buried where they fell. They were: Carter Burns, George Mills, William Backus, Jeremiah Griffin, and James Stanley. Two soldiers, Scott Graves and Thomas Rach, were reported missing. Their bodies were said to have been found and buried with their comrades weeks later. The seven graves were relocated in this vicinity in the 1960s. 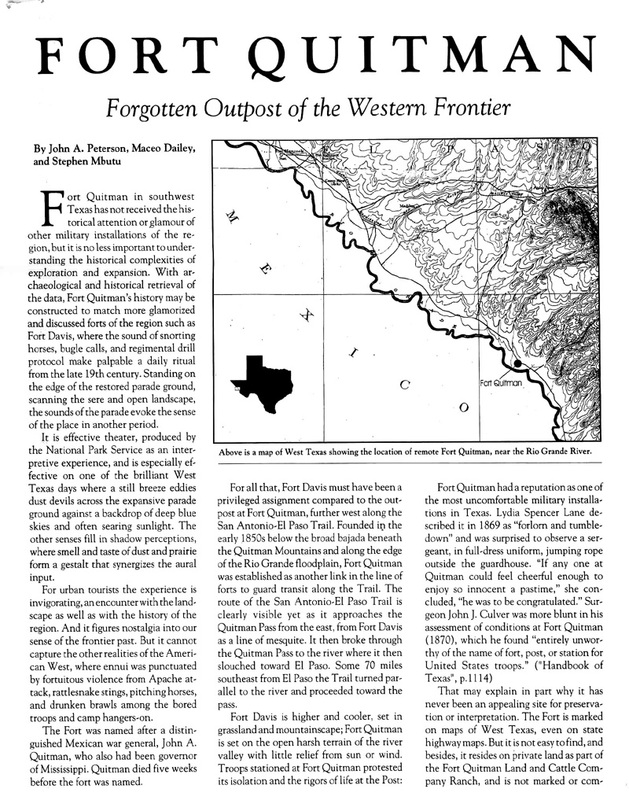 In 1997, University of Texas at El Paso (UTEP) Professors Maceo Dailey, Stephen Mbutu (now at Sul Ross State University in Alpine, Texas) and John A. Peterson visited the site of this forgotten outpost and authored an essay , (essay page 2) on the subject entitled Fort Quitman Forgotten Outpost of the Western Frontier. Located some 70 miles southwest of El Paso and close to the Rio Grande River, Fort Quitman is where 2nd Lieutenant Henry Ossian Flipper was imprisoned from six to eight months prior to being dishonorably discharged from the U.S. Army on trumped up charges. Fort Quitman was established in 1858 and was occupied until 1883. Among the units assigned to Fort Quitman were the 9th and 10th Cavalries of the United States Army. 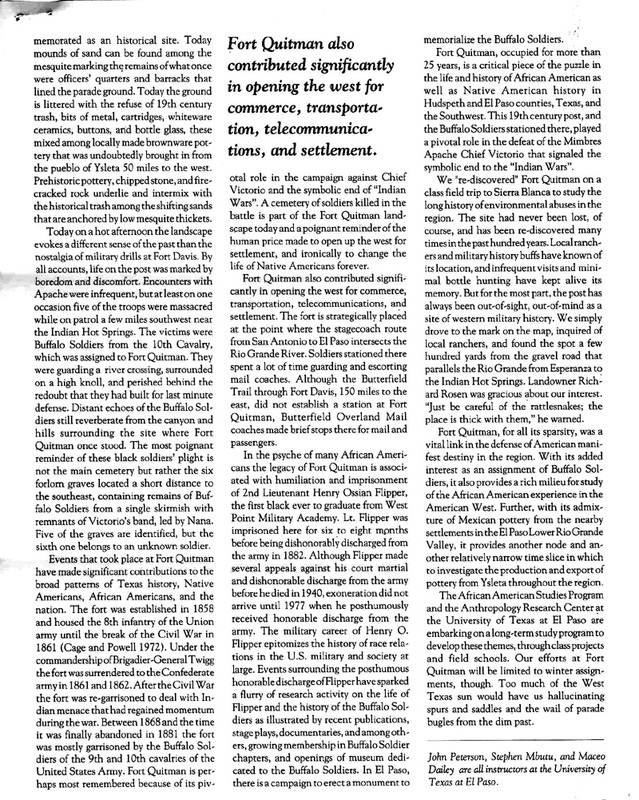 An outstanding recollection of the days of yesteryear and of the duty by Buffalo Soldiers while serving at Fort Quitman is exemplified in a patrol led by Sergeant Jacob Wilkes for the purpose of carrying mail from Fort Quitman to Fort Bliss at El Paso, Texas. It was 1873 and it was a routine patrol with each of the twelve troopers carrying a mail pouch and a Spencer repeating rifle carbine. Donnie W. Brown Chapter Historian, Trooper John Ryan reports on this anything but normal patrol as recounted by author Arlen Fowler in his book Black Infantry Experience in the West. Hudspeth and Culberson County were the scenes of intense action between the Buffalo Soldiers and the Apaches led by Victorio and later by Nana. The Battle of Rattlesnake Springs was northeast of Indian Hot Springs and Fort Quitman. This battle was on August 6, 1880. Further, the location where Sergeant Jacob Wilkes' patrol was attacked, Eagle Springs, was the location where Colonel Benjamin Grierson was waiting when Lieutenant Henry O. Flipper brought the word that Victorio had crossed back into the United States from Mexico.